Development of Electronic Visual Distress Signals (EVDS). Some of you may be aware of the development and marketing of hand-held non-pyrotechnic devices or Electronic Visual Distress Signals (EVDS) that are being offered as alternatives to pyrotechnic flares. Pyrotechnic flares are one of a number of methods specified in COLREG Annex IV that can be used or exhibited either together or separately to indicate distress and need of assistance. Many boaters now buy EVDS - so called “laser flares” - as an alternative to hand held pyrotechnic flares because of cost, safety and ease of testing and disposal. But are EVDS substitutes for pyrotechnic flares? From a practical perspective EVDS produce a light pattern that is different to the intense burn of a conventional flare and there is some concern that this might not be recognised as a distress alert. The advice therefore is that where carriage is not mandatory, EVDS should not be carried as a substitute for conventional pyrotechnic flares if the intention is to use them as the primary means of signalling distress. Mindful of this limitation, however, commercial and recreational vessels of any size may carry EVDS in addition to pyrotechnic flares for use as locating devices particularly for the ‘final mile’. Clearly where carriage is not mandatory, boaters are free to carry pyrotechnic if they wish and accept that disposal might well be an issue. For those who choose not to, then an alerting device listed in COLREG such as EPIRB (ideally with GPS and a homing device) or VHF DSC set (correctly connected to the GPS) which is suitable for the intended area of operation together with some form of EVDS for location in the final mile may be a suitable combination. In the meantime, work has begun internationally to research the effectiveness of EVDS. The US Coastguard has commissioned a study which is supported by the MCA. The aim is to work towards recognition of these devices. To do this, EVDS need to be accepted as fit for purpose by the International Maritime Organisation. A change to Annex IV of the Collision Regulations will also be required to give EVDS full recognition as distress signals. 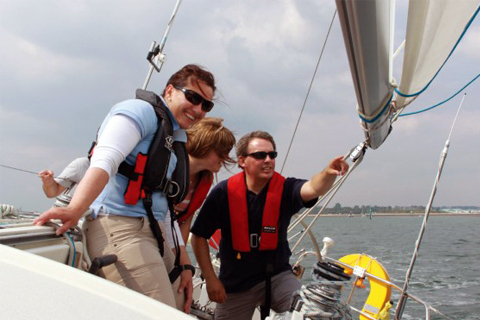 RYA Training - What is it? 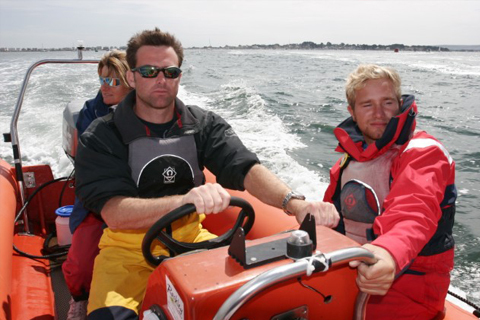 Elements Watersports runs RYA powerboat courses in New Zealand, here is some background on the great scheme that Pete has been involved with for 20 years. RYA Training celebrated its 40th anniversary in 2011 and over the years literally millions of people have participated in and benefited from the worlds leading collection of training schemes for a variety of boating activities. Many years ago some clever boffin came up with the bright idea to arrange some structured, standardised training based around sailing dinghies. I will not begin to guess whose idea this may have been initially for risk of offending someone. Needless to say, this idea was a stroke of genius and RYA Training was born. The training schemes revolve around a well thought through syllabus, delivered by RYA trained instructors and within the environment of an RYA recognised training centre. Annual inspections of training centres are carried out by the RYA to ensure that vessels meet the required standard and that safety management is effective and appropriate for the activities being undertaken. As a potential student, seeing the RYA recognised training centre logo should give you confidence that the training centre meets the high standards of the RYA and that you are safe in the hands of their instructors. Over the years the dinghy scheme has grown, initially through the support of clubs and military operations and eventually through commercial sailing businesses. Following on from the initial success in dinghies RYA training began to spread its wings and has since then developed training schemes covering: Sail Cruising, Motor Cruising, Power Boats, Windsurfing, Inland Waterways, Personal Watercraft, Shore based courses, ELearning, Super Yacht personal watercraft and keel boats. With a network of more than 2,500 RYA recognised training centres in 46 countries, 25,000 RYA qualified instructors deliver training to almost 200,000 people per year. It is the most successful scheme of its type in the world. The training is supported by a wide range of publications specifically designed to support individual courses across a wide range of schemes. Whether you are learning the basics of keeping a dinghy upright or the intricacies of meteorology there is an RYA publication to suit your needs. With more than 100 titles in hard copy and a range of digital publications growing by the week, it’s fair to say that we have something to cover just about any need you might have to read or learn about some aspect of boating. It would be remiss of me to speak of RYA training without mentioning qualifications. All of our courses are designed to build the knowledge, skill and confidence of the student. At the end of the course (subject to satisfactory completion) the student will obtain a course completion certificate that indicates they have a) completed the course and b) met the required standard. There are varying levels of courses so regardless of whether you are venturing onto the water for the first time or looking to further develop your knowledge after years of experience there is something there for everyone. More and more people are also choosing careers in the marine industry. Whether you’re aspiring to work on superyachts, get involved with the renewable energy sector or any one of a wide range of other industry sectors the RYA Yachtmaster certificate of competence is the ideal starting point. This qualification is a certificate of competence that is recognised both in the UK and in many foreign countries and is obtained after successful completion of a detailed and challenging practical and theory exam. Many people undertake this exam just for the personal satisfaction of knowing that they have achieved this envaiable standard of skill whilst others elect to do it to enable them to work in the industry. Across all of our training schemes there are clear pathways for people to progress all the way from novice through to actually instructing within those schemes. Some people will undertake their instructor qualifications to enable them to volunteer at their local club to assist others to learn how to sail. Others will earn their instructor qualifications in order to be able to go and forge a career in some aspect of the boating industry. The opportunities are endless. We have worked hard over many years to build the name and reputation of RYA training and qualifications. As a result of this we now find that RYA boating qualifications are accepted in most parts of the world as credible evidence of someones boating competence. On the professional front RYA commercial qualifications are the qualifications of choice within the superyacht industry and are accepted in many countries across the globe. Whether hiring a dinghy off a beach in the Caribbean, chartering a yacht on the Great barrier Reef or starting a career in Superyachts your RYA qualifications will come in handy. Most importantly RYA training is fun! Our courses are designed to provide particiapnts with the opportunity to learn both practical skills and theory knowledge in an on water environment. As a result hundreds of thousands of people are introduced to boating in some form each year and they do so in a safe and supported way that we hope will encourage them to carry on an activity that most of us are addicted to. And call Elements Watersports 0800 486 729 for how we can get you RYA trained in New Zealand.